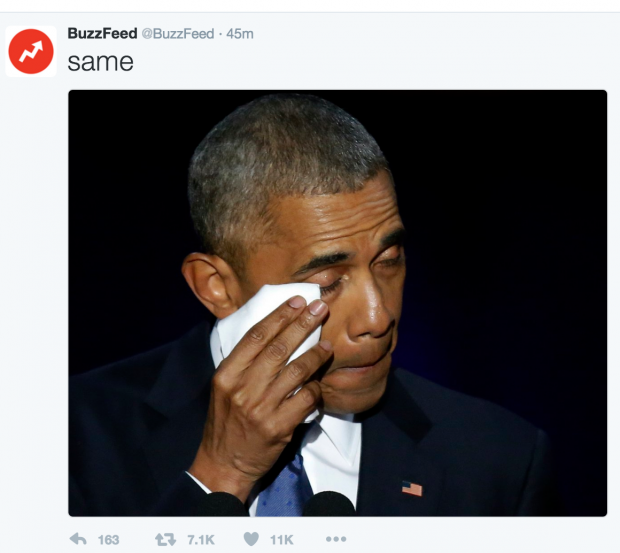 BuzzFeed editors tweeted that they were crying as President Barack Obama delivered his farewell address. This came just a few hours after the site published an unverified report by an alleged former British spy claiming President-elect Donald Trump performed lewd acts with Russian prostitutes. “Will I ever stop crying,” BuzzFeed senior editor Lara Parker tweeted. Another editor, Elamin Abdelmahmoud, wrote, “Aaaaand tears” during the address. The site’s executive editor Saeed Jones said that he hadn’t cried as much as he did during the tour since Beyonce’s recent tour.